The Cave Girls are our June Artist of the Month! The Cave Girls are our June artist of the month! 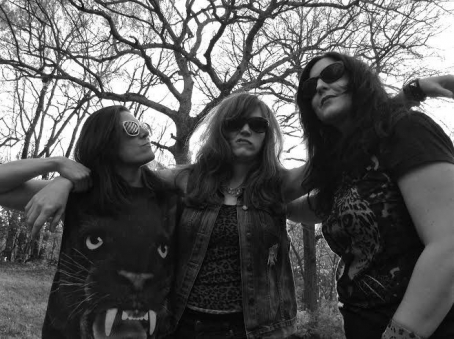 Robin Campbell and Stone Age Sara have gotten down the art of creating simple, upbeat, fun Neanderthal garage rock. With bassist Lizz Weiler as the band’s newest addition, the trio is returning to the KC music scene with a primordial vengeance. 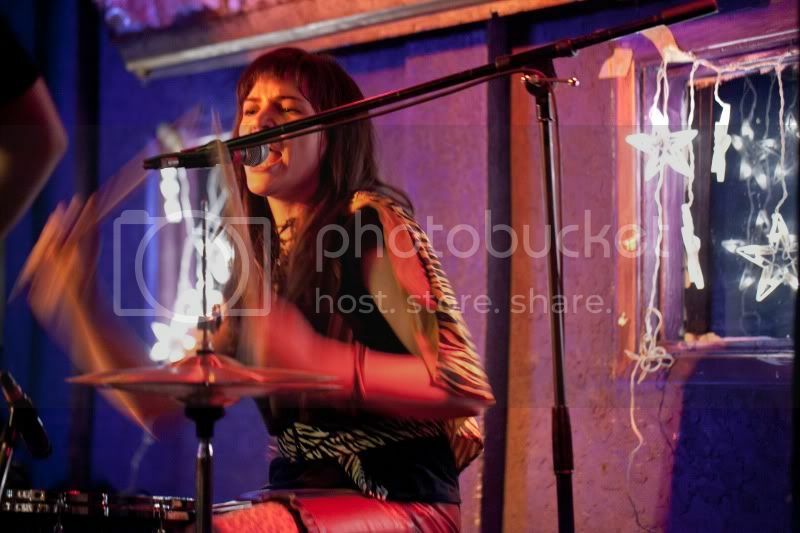 Stone Age Sara: Stripped-down rock ‘n roll with a prehistoric punch. The Deli: Give us some background on the band. How long have you had this particular lineup? Sara: Liz Lightning (Weiler) joined us on bass in the summer of 2013. Before Liz, Stephanie Williams (Katy Guillen & The Girls, Claire and the Crowded Stage) played bass with us for a couple years, and is on our first CD. Our original bass player was Nikki Love. Liz and Robin have played music together for years, so Liz is a natural fit. We are really grateful to have her! Sara: This summer is pretty busy! We are playing at the Free State Film Festival in Lawrence. Our music is featured in the film Replay by Marlo Angell with WOLF (Women of Lawrence Film), which is showing at the festival, and our set will be at The Granada on Sunday, June 29. We’ll also be featured on a CD compilation of The Pandoras’ covers by garage rock bands from all over the world. It’ll be released sometime this year for the 30th anniversary of their It’s About Time record. We’re excited to be a part of something so global! And we’re releasing a 3 song EP this summer too. Can’t wait! Sara: As musicians, keeping up with what fellow musicians are up to and being sincere and encouraging of each other. Everyone knows how good it can feel when someone acknowledges your work in a positive way. That can go a long way for a musician. We put a lot of ourselves out there. Liz: I would say supporting the local scene, supporting fellow musicians, friends, etc. Robin: Whichever I am watching at a given time... I am blown away at how good the local bands are around here. This must be what Detroit felt like in the ‘70s. I'm really impressed with Expo 70's meditative heavy rock with no lyrics. Also, recently I caught The Big Iron and The Philistines at recordBar; both were excellent! The Big Iron's new record is 4 stars!! Sara: Too many to list, so many I need to catch up on. Liz: Godzillionaire, The Quivers, The Mad Kings, The Lucky. Robin: Those Darlins. They're playing recordBar in August... GO! Their show is great! I am also really digging some instrumental music from an artist called Bonobo. Sara: I freakin LOVE Dinero out of Fort Collins. Liz: Kid Congo and the Pink Monkey Birds! Robin: I would love to play a festival with other KC/Lawrence bands/musicians for 3 days and camp out! I've always wanted to try playing a big multiple-day music festival. Sara: I don’t have one… But I sometimes think it would have been fun to be a back-up singer for the Kinks… except for the fighting. Robin: Hmm. I always try not to choose artists over each other, they all bring their own special gifts, but I guess I'd say John Lennon, George Harrison, Aretha Franklin & Loretta Lynn. John & George for their sincere love preaching and spiritual awareness. Aretha for her empowering woman essence. Loretta Lynn for her authenticity, and her courageous and sincere songwriting. Sara: Chuck Berry, Ray Davies, Harry Nilsson, Tiny Tim. All dudes and no drummers, I know, but that’s who comes to mind. They’re personal favorites, and I find them to be largely undervalued. Liz: Lemmy, Joan Jett, King Buzzo (just to see if they could get his hair right), and Dimebag Darrell. The Deli: What other goals do The Cave Girls have for 2014? Sara: We talk sometimes at practice about just having made it through another crazy week. There’s so much everyone is up against these days: personally, locally, globally. Liz put it really well at our last practice. She said “I just wanna rock!” and we were all like “YEAH!”, so that sounds like a good goal! Girls:We’re most up to date on Facebook, though we’d sure love to find a better way! Like a lot of bands, we feel pretty bummed when we post something on our page and less than 10% of our fans even see it. We’re also on Bandcamp. The Cave Girls: Ooga ooga Ug!Ug! Michelle Bacon is editor of The Deli KC and plays in a bunch of bands. Take in a movie and catch The Cave Girls at The Granada on Sunday, June 29 for the Free State Film Festival. Their set will follow the Nick Cave film 20,000 Days on Earth. Kirsten Paludan & the Key Party will also play. The film starts at 7:30 pm. This week's edition of On The Beat features prehistoric pummeler Sara Teasley of The Cave Girls and The Heavy Figs. She talks about hangin' with Mr. Alice Cooper and her philosophy on music and fun. Catch the beat right here! Nobody gives the drums a prehistoric pummeling like this week’s featured drummer. And she does it with a smile, too. Meet Sara Teasley. 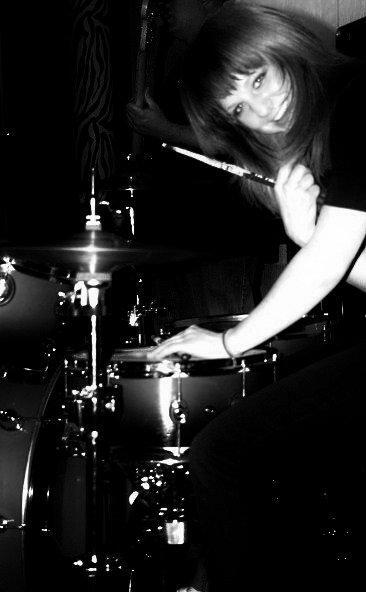 She’s a modern stone-age drummer. From the town of Kansas City, she’s a page right out of history! The Deli: I understand Alice Cooper had the distinct honor of meeting you. What was that like? Sara Teasley: Ha! Well, for Mr. Cooper, I think it was just another day in the life! For me, on the other hand, it was extremely cool and very memorable. It's not every day you get to meet a rock hero from your childhood. He was really friendly and funny and cool. And I enjoyed meeting his wife, too. She was really classy. The whole experience was such a fluke and pretty surreal. And, for what it's worth, I got to give him a Cave Girls CD! Woo hoo! The Deli: What's The Cave Girls' philosophy of life, music, and everything else? ST: To ROCK! Plain and simple. And to have FUN! That's how I see it, anyway. The Deli: Watching you play is so much fun, you're almost never not smiling. What makes you so happy about playing? ST: Thank you, that's nice to hear! A live performance is a complete thrill for me. I love sharing in that experience with my bandmates, and with the audience. Everyone plays an equally important part. I love being in the moment with that shared energy. ST: It's funny, but I didn't aspire to be a drummer. I was always really into music, though. One night, about 12 years ago, I somewhat randomly sat behind a kit at a friend's party, and the next thing I knew, I was keeping a simple beat with other musicians. It was such a surprise, a thrill that I never saw coming. It kind of blindsided me. After that night, all I could think about was, "When am I going to get to do this AGAIN?!" The Deli: You recently released an great CD, what was it like being in the studio with The Cave Girls? ST: We recorded with Pat Tomek. He's amazing to work with. It was easy, thanks to Pat. We felt so at home. Recording with Robin and Steph felt as natural as practicing with them, writing with them, or playing live with them. I remember laughing a lot and just feeling really comfortable. It was a wonderful experience, and I'm very grateful. The Deli: How do you go about creating your drum parts? Is there anything specific you listen for? ST: I am definitely trying to grow creatively. I usually play by feel, and lately I'm trying to move outside of what first comes into my mind. I'm trying to avoid ruts, but without being too cerebral. My husband Chris (guitarist and lead vocals for The New Lost Souls) has helped me a lot with that. We both appreciate the same sounds, right down to the littlest details in songs. I trust his judgment, and he always inspires a new way for me to approach a song. The Deli: One of my favorite songs off The Cave Girls CD is one you sing lead on, "The Maid." What can you tell us about it? ST: I love singing "The Maid"! It's pretty autobiographical, I wrote most of it while on a job. The lyrics came about as I did the specific things I sing about, "I see my reflection in the glass when I'm cleaning the door." I was literally cleaning a glass door. Work like that can take a lot out of you, but your mind is completely free to dream and create. "The Maid" will always be very special to me. Rory Gallagher and Taste are running through my head like crazy these past couple of days. Also, "Say Those Magic Words" by The Birds, which The Cave Girls are covering. The harmonies are a blast. Any projects aside from The Cave Girls? Yes, The Heavy Figs is a new three piece with Chris Teasley on guitar and John Cutler on bass. It's so much fun playing in a band with these two. Some real magic happens when Chris and John play together. I'm not worthy! But I'm in! You may or may not be worthy, but you should definitely try to catch Sara in action anyway! The Cave Girls play on Wednesday, July 25 at Angels Rock Bar and The Heavy Figs play Friday, July 27 at Coda.